This is my first post in this forum! I've been in the market for a relatively low-powered, high-gain tube amp lately and have been considering a range of options. My issue is that I play such a wide range of genres including Jazz, Blues, Classic Rock and a lot of Heavy Metal. So I'm sure you could appreciate that its been very difficult for me to find a tube amp that does all these things well. 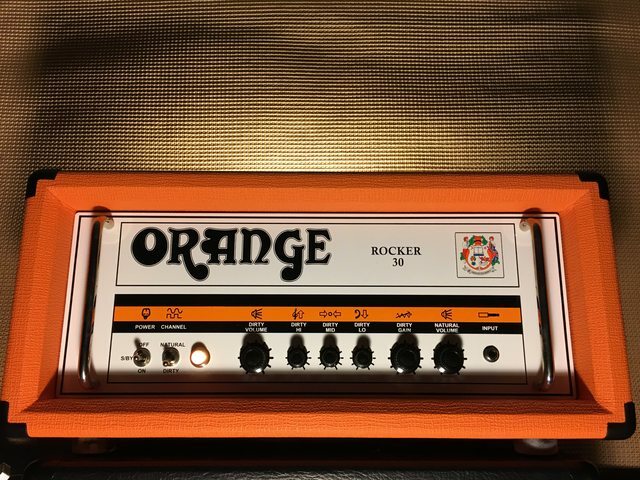 I recently came across the Orange Rocker 15 Terror and on paper, it sounded quite attractive. I tested the amp at my local music store and my first impression was generally very good. I actually liked the clean channel (which I wasn't expecting to) and the dirty channel was awesome throughout the entire gain range. My only bug was that it couldn't do particularly high gain tones such as Metallica or Iron maiden, which is understandable considering is not designed to be a high gain amp. But these tones are very important to me and I was wondering if anyone here knows if these kinds of tones are attainable from the amp (though a pedal or something else). Oh, and before anyone suggests the Brent Hinds version, I tried it out and although it did have more gain, I really didn't like the voicing of it. Its one of these cases where I really really want to buy the amp, but if it can't make these tones, I just can't have it. Well, industry standard for that purpose is putting a tubescreamer as a front-end boost. Level maxed, drive dimmed, tone to the taste and that will give you definately more gain, punch, body and midrange. Keep in mind that also it will cut some low end. There are many tubescreamer-esque pedal on the market, lots of them with added tricks, twists and clever ideas, but still you can't go wrong with classics like Maxon OD-9 / OD-808, Ibanez TS-9 / TS-808 or cheaper (but not worse!!) option Boss SD-1. Other way around would be a traditional boost/eq pedal. Tone-wise, they are in most cases more neutral (or transparent, keeping amp's eq curve intact), yet they give just more juice and volume depending where you place them (front-end or fx loop). Boss GE-7, BB Preamp, TC Spark Booster, MXR Micro AMP - tons of options. I've definitely heard about the tube screamer method, however, I haven't been able to try it with the Rocker 15 since the shop I went to didn't have a Tube Screamer in stock. However, do you know if that could allow the Rocker 15 to get Metallica tones? Also, can boost pedals give me more gain (I never really need more volume)? Alternatively, I just watched a couple of demos online of the Dual Terror, it seems to have more gain than the Rocker 15, what do you think of that? I think if you really crank the rocker preamp and boost it with tubescreamer it should get you into general hi-gain territory. Keep in mind that there are amps in Orange lineup which seem to be more suited for metal. Think Dark Terror or Jim Root Terror. They still give you a classic crunchy tones, but are also capable of some brutal stuff. Both the Rocker 15 & Brent Hinds are not considered high gain amps like their older brothers; Dark Terror, Jim Root, Dual Terror, & Tiny Terror. They are no less great amps and their vintage voiced tone is to die for. Yes the "Natural" channel was a surprise to all but if you think about it a channel who's signal just goes from the guitar to the power and not thru any internal interactions suggests very clean. But for you to get the Rocker 15 & Brent Hinds into high gain territory ala Metallica, an overdrive will help. Metallica is more metal than I do, I'm at the max with an Ozzy/Randy Rhoads kind of high gain. I have an Ibanez Tube Screamer TS9, a Way Huge Saucy Box overdrive, an MXR il Diavolo and the MXR EVH 5150 OD. I don't really need extreme ultra high gain just the right amount to maintain my favorite tone from my 5 Orange Terrors in a 70s & 80s Classic/Hard Rock influenced playing. One of these amps with a good overdrive gets me there easily, maybe even just a gainy dirty boost pedal similar to the now discontinued Way Huge Angry Troll. I'll also add that you can try another method by swapping out the V1 Preamp tube with a "gain tested" one of another brand. Its not going to yield that much more, just a hint at max, in my opinion, maybe enough for your needs. You can find a lot of info on other tube brands and how they get tested to add gain on certain amps online. I was trying this with my Dark Terror by swapping out the stock JJs using tubes by Sov-Tek, Tung-Sol, EHX, & Groove Tubes. All had mixed results, some just a tad more gain but not enough to even care. However, I still wanted to but it out there, you may want to experiment for yourself...Good Luck, post back what you decided. Tube Screamer will definitely help, works for Kirk Hammett. I’ve done side by side of a Dual Terror and Rocker 30. They can sound similar but the Rocker preamp has more gain available. It's probably nit picking in my part.... but the rocker 15 natural channel isn t unaltered guitar tone. It has some tone filtering / sculpting, you just can't adjust them. Not according to what I heard from some Orange salesmen and amp techs I've talked with. But, electronically, its whatever the signal has to pass thru till it becomes an audible signal emanating from the speakers. So yes, obviously there is, for one the tubes, also the volume pot, and whatever copper wiring and soldered points there are, but arguably, that is very little if you exclude it passing thru the EQ electronics, which means the most natural tone possible (hence they naming the channel as such). What I heard the tech say was that from the start point (your guitar) and end point (the power stage of the amp) there is little involvement, circuitry speaking. I don't hear any sort of filtering or sculpting you suggest nor altering of the signal in any way (at least the tone I get is what I would imagine my electric guitars sound like without anything added to them, unless of course you include whatever is added thru the FX Loop like delays, reverbs, and modulations. It does pass thru that stage of the amp as well. The mystique about electric guitars is that you cannot expect the definition of "Natural" as being the same compared to an acoustic which is nothing more than the strings vibrating and echoing out of the wood. Electric guitars involve electronics where there will be some interactions, in this case as very little as possible. Hey guys, thanks for all your feedback! I went back to my local music store yesterday and tried out the Orange Dark Terror. I have to say, it blew me away! I was shocked that I hadn't seen people recommending that amp for me as it covered all the basses i want. Reducing the and stepping on the volume produced a surprisingly good clean sound, a touch off my volume knob and it sounded perfect! As for the gain, its just what I was looking for, the Orange tone, but more gain... The gain is also quite wide-ranging. I was able to get blues classic rock tones as well as thrash metal tone, it was so satisfying to play. It has an FX loop as well which is great. The only downside I guess is that its technically a single channel amp, so I wouldn't be able to switch from a clean to a high gain without twisting some knobs. But since I don't play in band or anything like that, I think I'll be fine. After a ridiculous amount of time looking for an amp, I think this is it. If anyone has any bad experience or suggestions regarding it, please let me know! Last edited by Les Paul Lover on Mon Feb 04, 2019 11:15 am, edited 1 time in total. Last edited by Les Paul Lover on Mon Feb 04, 2019 11:37 am, edited 1 time in total. sparse controls. I did not get this amp for Metal, but it suits me for Classic Rock and (yes) there is an Orange flavored “clean” to it which to me means that there is always an “aura” or “halo” of breaking-up surrounding each note that I play (and it's degree is user defined). I think that holds true for all of the Terror amp series, and it seems to me to be what separates Orange amps from Fender, Marshall and the usual offering out on the market. You'll probably find the ideal setting for the gain knob. My preference is to have it set no higher than noon. If you use your ears, I think that you'll find some great tones in your choice of Orange. Not sure if its relevant but the R30 natural channel pre-amp stage has a flat response from below 20Hz. it is pretty unique among guitar amplifiers in that regard.. I am of course, not sure 100% that the R15/32 is the same schematic.. Assuming that the natural channel is flat, the OP's best metal tone is a metal oriented distortion pedal or metal based pre-amp pedal direct into the clean channel. Did you scope it like you scoped you TH30 dirty channel shape control? It was so helpful to visualise what actually happens when twisting that knob. I'm not entirely sure the R15/R32 is 100% the same as the R30, but certainly directly inspired by it. I can see the usual RC filters, but can't tell nor calculate how they impact the overall tone. Perhaps I should look to probe at the natural channel volume wiper for the spectrum analyser.. Anyway, in the case of the R30, like you i simply looked at the schematic and judging by the cathode bypass cap on V1a and the input decoupling cap it looks to be a very wideband amp by guitar amp standards.. quite possibly the reason for the Orange "girth" in the low mids?.